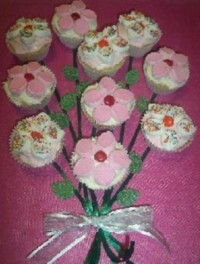 Every girl loves flowers and this bunch of Flower Cupcakes is perfect as a birthday cake. Both glace frosting and buttercream frosting are suitable for this design. Ice half of the cupcakes pink and the other half white. Using scissors, cut marshmallows in half. Place cut side into 100s & 1000s or castor sugar. Squeeze ends of each marshmallow together to form petals, as shown. Decorate white cupcakes with five pink marshmallow petals and pink cupcakes with five white marshmallow petals. Position Smarties or M&Ms as centres, or alternatively pipe a small amount of extra frosting. Position birthday party cupcakes on a cake board that has been covered with decorative paper, contact, or any type of patterned foil-like gift wrapping. Cut curling ribbon into uneven lengths and position on board. Tie stems together with a bow and secure with a little buttercream, if necessary. Position spearmint leaves along stems and secure with buttercream.